To complement the recent launch of Pokemon Omega Ruby and Alpha Sapphire, the latest Nintendo eShop update is headlined by Pokemon Pinball Ruby and Sapphire. For those unfamiliar, Pokemon Pinball Ruby and Sapphire is, as its name suggests, a pinball adaptation of Pokemon Ruby and Sapphire, the same games that provided the basis for the recent Omega Ruby and Alpha Sapphire remakes. In Pokemon Pinball players are still working toward catching all the Pokemon available, but the core series' lengthy adventures are replaced by complex table layouts and bouncing silver balls. 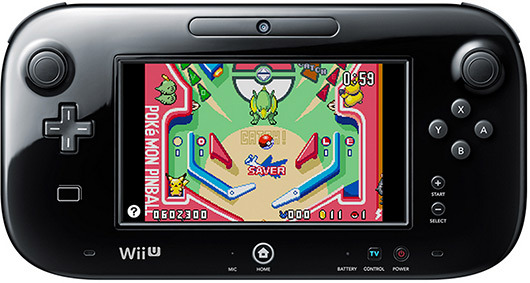 Pokemon Pinball Ruby and Sapphire is nowavailable from the Wii U eShop for $8. The other half of this update is the GameBoy Color platformer Bionic Commando: Elite Forces. It's not the best in the series, but it's also not the worst, and it is notable for relatively novel gameplay and what the developer's were able to do with the aging handheld hardware. Bionic Commando: Elite Forces is priced at $6. Capping off the update are a list of sales. Joystiq favorite Shovel Knight is 33 percent off on both Wii U and 3DS until January 8, Unepic is 30 percent off on Wii U until January 29 and the 3DS eShop is hosting 50 percent discounts on bothDress to Play: Cute Witches! and Dress to Play: Magic Bubbles! until February 1. Sqrxz 4 is another instalment in the Sqrxz Jump'n'Die franchise, pardon: certainly we mean Jump'n'Run, series, based on the original !SQRXZ! game created by Marcus Vesterlund and John Holmvall. After Sqrxz saving Yve in “Sqrxz 3 – Adventure for Love” it was truly a happy moment. Being still heavily in love they decided that the time for a tiny wedding ceremony has come. The celebration party was marvellous and still people talk about this heart breaking moment. Couple of months later both were sure that the time for an own small family has come. Although those are happy news Sqrxz is consequently short of money and a growing family requires a solid financial base. Picking up a newspaper and reading the job offers, a single add caught Sqrxz’s attention. An expedition in search of ice marbles needs a brave explorer. After all, he has gone trough a deep jungle to rescue Yve and made it back. This sounds like a job for Sqrxz! After meeting Dr. Branxz, who looked a bit creepy and shady, the deal has been set up and Sqrxz is brought to a mysterious island… full of shiny ice marbles. “Not a single one should be left there”, Dr. Branxz said, that just one missing marble will result in a pay refusal and not taking Sqrxz home. If you think Dr. Branxz didn’t do his homework, he very well did: His spy satellites spotted exactly 354 marbles. Challenging, isn’t it? Giana's Return is a multi platform sequel, taking place few years after the The Great Giana Sisters. Evil Swampy and his followers have stolen the magic ruby, which made it once possible for Giana and Maria to return from their dream. Many creatures are after this ruby, but does it really has power, or was it just a coincidence?As this is not bad enough, Swampy fell in love at first sight with Giana’s sister Maria and shamelessly kidnapped her. She simply has been at the wrong place at the wrong time.You will now have to take on the role of Giana and get back the magic ruby. And most important of all, save your beloved sister Maria and get home save! Good Luck! Sky Kid - Enhanced released for NES!!! Just in time for Christmas, Final Fantasy VI Ted Woolsey Uncensored Edition has been updated to version 1.6! With this updated release, two versions come in the package. One is the complete Uncensored Edition, without any further bug fixes to give the unchanged experience as if it was just released on the SNES. The second version adds a modest amount of bug fixes that don’t, for the most part, alter any gameplay, but fix problems that should have been fixed upon its initial release 20 years ago! Both versions have a few tweaks that were needed such as updated item descriptions, and Raiden is now no longer a downgrade to Odin. HorvatM has released a new, superior assembler for the V810 processor used in the Virtual Boy, called simply "Matej's V810 assembler" or "MV810ASM" in short. It has a working expression evaluator, local labels/identifiers, can automatically assign addresses to global variables, supports VB-specific instructions, recognizes both the "$" and "r" way of referring to registers, automatically aligns everything, has clear error messages, and you can just use it in any way you want. It also has a ROM-hacking mode with which you can apply a hack to a ROM in one step, no hex editing required. You can get it for multiple platforms on Matej's Website. For more info and discussions check out the respective forum thread. Also check out the source to Matej's Faceball control scheme hack for a practical ROM hacking example. Happy new year! It's 2015 and it will certainly be a great year for all you fellow Virtual Boy fans! Not only will your favorite website turn 15 years old in a few days, but this year will also mark 20 years since the Virtual Boy hit the market in 1995. The community here at Planet Virtual Boy is going to celebrate the Virtual Boy's 20th anniversary all year long with all kinds of cool projects. New homebrew games & tools, fanart, music, ROM hacks, competitions... whatever we can come up with. It's #VirtualFest! Please see the official thread for an always up-to-date list of #VirtualFest projects. Of course, the greatest projects will also hit the frontpage news. So, what will be your project? We've got a nice little suprise for you at the beginning of this new year. Let us take you back 26 years in time with our first release of the classic European Club Nintendo magazine. This magazine was distributed in a lot of European countries. The only variable being that the text was directly translated into the appropriate languages. We chose the UK version since this will be most convenient for the majority of our readers. This magazine started of as only being 20 pages, which grew to 36 pages later on in it's life cycle. Therefor we selected only two preview articles to give you a feel for the magazine before hitting the download button. The first article is a short review for Kid Icarus, while the second one takes a look at the game on the cover: Rush'n Attack. Enjoy! The 3DS scene just keeps getting more and more interesting and with a new year comes a new breakthrough in 3DS emulation. The hard working team behind the Citra Emulator have announced that they have managed to get Ocarina of Time 3D running in game in a stable and playable state. Click on the link below to discuss this great achievement and to keep up to date with its developments. - Upon startup, let Start show the most recent files only if there are any. - Properly handle save slot medium if all ten medium slots are still being used. - When statistics become full, don't discard entries which might still be part of the recent list. - When global statistics are loaded, pick the latest version under all circumstances. The provided example works like this. The map is made up of a series of objects placed in a grid. The map data is then stored into an array allowing for map objects to be rendered as necessary. This allows for a large, interactive, and randomly generated map and more! All this has been done before by me and others on the forum, but I extended this idea to that of an open world game and added support that gives the game the effect of walking around outside as well as exploring various buildings and going to different floors inside of the buildings without needing the use of several DSGM game rooms. To work the demo, use the dpad to move your character around (i know the camera isn't fixed right, but this is just for demonstrations only). The blue blocks are meant to symbolize walls/roofs of buildings. The door sprites act as doors to buildings. Walk up to a door and press A to walk in and out of buildings. The up and down arrows represent ascending (up arrow) and descending stairs (down arrow). Walk up to them and press A to walk up or down the respective staircase to travel to a different floor of the building. Although this example isn't randomly generated, it could all be done so if I just added a few "Random(min, max)" calls. This engine could be used to do many things, but I haven't finalized a target project yet. I originally started this a while back to use for another sequel to my "The Living Dead" series. It would be an open world game zombie survival game with the ability to scavenge houses and stuff like that (kinda like games like DayZ). Also though about a grand theft auto type game, but am open to any kind of suggestions really. I hope you guys enjoy! That's the maximum number of sprites you may load with the lib I'm working on. I started this a while back when Foxi4 made that 3D Sprites example then after studying how Foxi4 made his Nitro Sprites Loading lib I imitated the process for loading 3D Sprites. I'll release the lib and examples to go with it soon. Marat Fayzullin has released new version of its GameBoy emulator VGB-Windows. I have just released VGB 4.5 for Windows and Linux. To give you all something to do for the holidays, VGB-Windows is now free for everyone to use and share. The new release adds dozens of new features and fixes accumulated since VGB 3.5 has been published several years ago. VGB 4.5 emulates GameBoy Light, GameShark, the tilt sensor, MBC7, TAMA05, and MMM01 memory mappers. There have been major fixes to GameBoy CPU and LCD controller emulation. The noise sound channel is much closer to the original in this version. I have also added support for translation patches (.IPS), custom palettes (.PAL), Instant Replay (F , and a semi-automatic Cheat Hunter tool (F5) to search for new cheat codes. See the complete change list below. Added TAMA5 mapper emulation (Tamagotchi 3). Added MMM01 mapper emulation (Taito Variety Pack and Momotaro Collection 2). Added MBC7 mapper emulation (Kirby´s Tilt´n´Tumble). Added optional DI+HALT CPU bug emulation. Added proper noise channel emulation. Added 93cXX serial EEPROM emulation. Added support for .IPS files. For "mygame.gb", use "mygame.ips". Added support for .PAL files. For "mygame.gb", use "mygame.pal". Added "instant replay" feature letting you go back in time ([F8]). Added tool that lets you hunt for new GameShark cheats ([F5]). Added "vertical scanlines" emulation, as found in old LCDs. Added "raster effect" emulation, as found in newer LCDs. No longer compressing .SAV files, to avoid confusing the users. Made LYC IRQ happen instantly when LYC set to the current scanline. Made LCD controller reset scanline when it is reenabled. Now enabling LCD controller on startup (Aerostar, Alfred Chicken, etc). Now disabling IRQs on startup (Robocop 2, Shadowgate, etc). Now checking IRQs when ISWITCH/IFLAGS modified (Final Fantasy Legend). Now "ticking" RTC while not playing (time progress in Pokemon, etc). Now clearing scratch RAM after reset. Now locking out opposite arrow keys. Now resetting DIVREG on writes. Fixed IRQ priorities, with VBlank IRQ getting top priority. Fixed sprites-over-window display to avoid hiding sprites. Fixed corrupted Super GameBoy backdrop on startup. Fixed saving and restoring sound chip state. Fixed saving and restoring SGB colors. Fixed "JR offset" and "JR Z,offset" instruction timings. Fixed exit from HALT instruction. Rinnegatamante offers version 1.0 of '3DS Briscola', portage of the card game traditional Italian La Brscola for the nintendo 3DS. Hi, does someone knows Broccoli? Broccoli is a popular italian card game and i made years ago a Briscola card game for PSP (PSPBriscola). Pspbriscola was coded in LUA (LPHM7) so i managed to port it to my LUA interpreter (lp-eds) because lp-3ds syntax is very similar to LPHM7 syntax. Neopop for 3ds. An ugly port by Seagal. I know, the emu is slow, the controls are baggy, there isn't sound, even the neo geo pocket picture is not displayed correctly. But as I will not have more time to touch the code in a month or so, i decided to releases this as is. Merry Christmas. So when I first heard about finally being able to create homebrew for the 3ds, I started thinking about what I would like to make first. I love music first and foremost (I'm a pianist and I compose my own music) and I also like to code. This is my first attempt at ever doing anything in C + + and I am very proud of myself for what I've done so far. The homebrew is a 3DS Piano application. The current name is just called "Piano" but I might change it later, I don't know. Right now when you start the application it's just a simple keyboard that you can use your stylus on to play each note. You can hold down a note to hold the note out, or you can just do a quick tap for a staccato. You can also just run the stylus across the screen and it will do an awesome glissando. Also, it currently has a full octave ranging from C3 to C4. I plan on adding a way for more notes later. Download homebrew from the internet! The homebrew browser allows for easy loading of new homebrew software onto a homebrew enabled 3DS. You should already be able to run the Homebrew Menu/Launcher to run this code. Your 3DS should be connected to the internet for this to work. Drop the homebrew-browser folder into the /3ds directory on your 3DS's SD card. Don't rename the folder or the application - there are some paths that are presently hard-coded and rely on these paths existing. The basic use of the browser is via the +Pad or OPad and the A button. Use the pad to navigate up and down the list, and the A button to download the highlighted app. The L and R buttons filter by category - they are games, media, emulators, utility, and miscellaneous. Select will change the sort order. X opens the debug console on the top screen. Similarly, the main controls can be touched as well - to navigate, drag the scroll bar. To download a title, tap on it. Presently, the server's source is not yet available, but if you would like your app to show up in the browser, please send an email to zeta0134@darknovagames.com. We may add apps that are licensed with GPL or other distribution-friendly licensing automatically; if it's popular and announced publically, we'll probably add it for you. If you would like your app removed or some detail about its listing changed, don't hesitate to contact us. It's currently in beta, and there is no 3D yet, but I am working on making this a good version/port of the game! lots of graphical glitches and you need to play with the 3d slider to make it look decent. Some people wanted an IRC client, this is alpha quality but it's usable and pretty stable. I'll be releasing the source later, maybe tomorrow. Configure it just by editing mapleIRC.settings. It's got all the important bits: Mario jumping, the castle, Princess Peach looking surprised. Along with the usual caveat that it's a fan-made, non-profit, please-Nintendo-don't-shut-us-down disclaimer. Here's the latest development video showing the progress to date. You can keep up to date with the project over at its Facebook page, where the developers occasionally stream their ongoing work on Twitch. Citra Git (2015/01/05) is compiled. Citra is an experimental open-source Nintendo 3DS emulator/debugger written in C++. At this time, it only emulates a very small subset of 3DS hardware, and therefore is only useful for booting/debugging very simple homebrew demos. Citra is licensed under the GPLv2. Refer to the license.txt file included. AddressArbiter: Ported arbitration type 2 from 3dmoo. * AddressArbiter: Ported arbitration type 2 from 3dmoo. This will happen when the mutex is already owned by another thread. Should fix some issues with games being stuck due to waiting threads not being awoken. citra-qt: Added license headers to files. * citra-qt: Added license headers to files. Yanese v0.52 is released. Yanese is a free Nintendo Entertainment System Emulator running in Windows XP,Vista, 7 and 8 under x86 and x64 processors. - Video: NES Aspect Ratio was working bad becouse i wasn't appling linear interpolation. Now looks really good. - CPU: Flags operation emulation changed. - Video Recording: 1- Mp3 Quality -> poor: 64 CBR , normal: 96 CBR and high: 128 CBR 2 - There was a bug when the video was recording and closed yanese that left the video file unplayable. Fixed it. - Save States: 1 - Since i changed the CPU internally flags operations previous save states format doesn't work with this version. Sorry. 2 - Fixed and issue when tried to load save state and the background on and off deffered from the save state file. - Emu Info: I changed the emu emu info out (pause, suspend, etc) to look (i think) better. You can see it in the screenshots below. Fceux SVN r3091 is compiled. FCEUX is a cross platform, NTSC and PAL Famicom/NES emulator that is an evolution of the original FCE Ultra emulator. Over time FCE Ultra had separated into many separate branches. The concept behind FCEUX is to merge elements from FCE Ultra, FCEU rerecording, FCEUXD, FCEUXDSP, and FCEU-mm into a single branch of FCEU. As the X implies, it is an all-encompassing FCEU emulator that gives the best of all worlds for the general player, the ROM-hacking community, and the Tool-Assisted Speedrun Community. DeSmuME SVN r5067 is compiled. DeSmuME is an open source Nintendo DS(NDS) emulator for Linux, Mac OS and Windows. DeSmuME supports save states, the ability to increase the size of the screen and it supports filters to improve image quality. DeSmuME also supports microphone use on Windows and Linux ports, as well as direct video and audio recording. The emulator also features a built-in movie recorder. Dolphin Git 4.0-4922 is compiled. This is the trunk of Dolphin Project. Dolphin is the first Gamecube emulator able to run commercial games! Dolphin is a Gamecube, Wii and Triforce (the arcade machine based on the Gamecube) emulator which supports many extra features and abilities not present on the original consoles. It has a partial Wii support and plays most Gamecube games. - JIT: simplify ISI handling. Swiss SVN r296 is compiled. The swiss army knife of gamecube homebrew. Swiss aims to be the ultimate utility Gamecube homebrew application. 3dmoo Git (2015/01/03) is compiled. 3dmoo is an open-source Nintendo 3DS Emulator Prototype. It does not run games (yet). * Fix hard coded physical addresses. * Reschedule threads after svcCreateThread, svcSignalEvent and svcSendSyncRequest. * Fix some threading bugs with PROPER_THREADING. Got a few hundred quid burning in your pocket? A soft spot for classic gaming, and a love of Ray Parker Jr.? 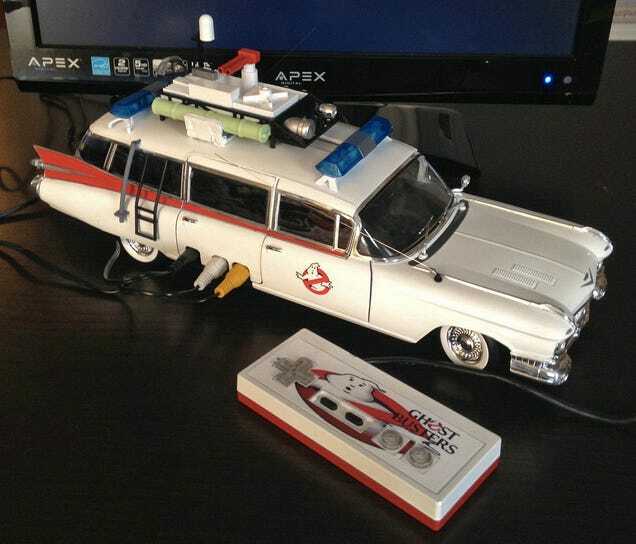 Then eBay seller ultimatecustoms1982 has a convenient way to scratch all three of those itches at once with this custom-made original NES consoleshoe-horned inside of a die-cast replica of the Ghostbusters' Ecto-1. Nintendo's iconic characters have appeared more than once in third-party console games (hello Soul Calibur fans), but mobile games have largely been off-limits. However, there are new signs that the gaming giant is taking a more relaxed approach to the handheld world. GungHo has unveiled Puzzle & Dragons: Super Mario Bros. Edition, a take on the popular puzzle battler that includes many of the characters from Nintendo's most sacred cash cow. 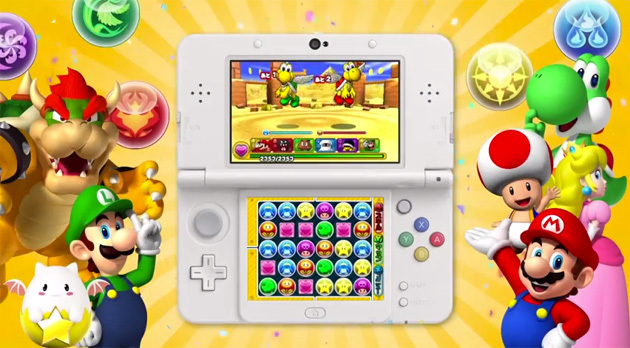 It's not surprising that there's only a 3DS version so far given Nintendo's usual disdain for smartphone games, but the regular Puzzle & Dragons is also available (and successful) on both Android and iOS -- it wouldn't take much to get the Mario variant on non-3DS systems. Will that happen? Probably not. Even so, GungHo's game is further proof that Nintendo isn't as protective of its franchises as it used to be. Wii U Smash Bros owners unwilling to pay the current high prices for the official GameCube adapter now have another option. As spotted by NintendoLife, import site Play Asia is currently taking order on an unofficial GameCube controller adapter that’s compatible with Wii U, PC and Mac. It costs just £13.25/$19.99 and is due in stock this month. It appears to be a new time and has not yet received any user reviews, so the purchase would probably be a bit of punt – albeit a relatively cheap one. Prices for the hard-to-find official peripheral that arrived alongside the Wii U game last year have soared, with prices on Amazon stretching from £759 to £147.50. The accessory is out of stock at most other retailers. There is currently a factory sealed copy of extremely rare (there are only two copies in near-mint condition on Earth) NES game Stadium Events listed on eBay. It's reached a bidding high of $100,000, and it still has six days to go. Unfortunately, there is likely foul play involved. As Wired outlines, auctions like these have a history of attracting trolls. This auction is, according to GameSpot, definitely legit—an ultra rare sports game recalled days after its 1987 launch being sold by a former Nintendo employee—but it's happening on the Internet, paradise of consequence-free pranks. Wired's report points to Stadium Events' bidding history, which blasts off into ludicrous land right around the $30,000 mark. At that point, a single user begins incrementally escalating the price over and over and over, all the way up to $90,000. This user has only ever bid on one item—this one—and all they stand to receive for not ponying up is a strike against their eBay account. So basically, a slap on the wrist, a "boo-hoo" from behind a brick wall of feigned empathy. Big whoop. A couple other "buyers" use the same tactic to carry it up to $100,000 and beyond. "This has happened a few times recently: Witness the profoundly ugly copy of Nintendo World Championships, estimated to be worth about $5,000, but bid up by trolls to just under $100,000. Later, the seller said that the game was sold privately for $5,000, the price at which he had set the auction's original opening bid. The 11,000-game collection that the Guinness Book called the 'world's biggest' was auctioned on another site called GameGavel for over $750,000, but to this day it has not yet sold at any price." And yet, websites report that games have "sold" for Stupidly Outrageous Sum Of Money, and no one's the wiser. Another troll job in the bag. Drinks on me back at the Troll Enclave. So keep your eyes peeled for this stuff. Don't always believe what you see. Even if you're not directly feeding the trolls, sometimes they're feeding off you. A factory-sealed copy of ultra-rare 1987 NES game Stadium Events is currently on eBay for $40,000 (£26k). The title is considered to be the rarest officially-released game for the console due to it being recalled mere days after its initial 1987 launch. Stadium Events was released by Bandai as a test title for its Family Fun Fitness Control Mat - an early version of the technology now found in Dance Dance Revolution floor pads.But Nintendo bought the technology for itself, just as Stadium Events was being released. The company ordered an immediate return of existing copies so the game could be rebranded with Nintendo's updated version of the controller mat, now named as the NES Power Pad.2000 copies of the game were produced before the change occurred, although only 200 made it onto store shelves.Of those 200, only a handful were actually sold and made it into circulation. Of that handful, only two copies are known to still be in their original boxes. This is one of those two.The seller explains that he previously worked at Nintendo and has owned his copy since the early 1990s. "This listing is for a complete, excellent+/near mint, sealed copy of the game and the one of few to ever be sent to the Video Game Authority in Roswell, Georgia for official grading, verification and authentication," the seller explained. "Once the game arrived safely, the professionals at VGA gently cleaned the item, verified it, graded it and sealed it in a professional quality acrylic case where it will remain for the rest of its life. "Bidding on the item originally began at $5000. The sale is due to conclude in just under a week's time. We would like to say thanks to our users for testing the public beta and reporting bugs. and released it as Gateway ULTRA 3.0.1, available in the Downloads section. The downgrade packs have now also been added to the Downloads section, please download the proper dgpack for your region if you want to downgrade. We want to caution users using the downgrade feature: it is a dangerous operation as it will write to sysnand and if something goes wrong it may brick your 3DS. We currently recommend that ONLY USERS WITH A NAND MOD try this, and report back any issues. If you want to restore your NAND.BIN from SD Card to sysnand, simply hold UP when entering the Downgrade menu will launch the restore menu. This can be used to go back to your original NAND, such as before downgrading. Support any 3DS system version(including the newest V9.4.0-21U/E/J). Q: I have a new 3ds with the firmware 9.3.0-21J version. your new flashcard can work on this version or not? A: Yes, Sky3DS card can support the newest 3DS V9.3.0-21J version. Q: Will it be able to play New3DS exclusive games? A: Yes, SKY3DS can play any New3DS exclusive games. A: Don't need to do any special thing, just drag and drop the downloaded ROMs in MicroSD card by the Disktool we provided, and enjoy it. A: No, don't need any emunand at all, it can support any 3DS system version even the newest V9.3.0-21J version. Because it's region locking like a real gamepad, you can't play US or JP's games on your EU 3DS console. If you own a Wii U and wish you hadn't missed out on years' worth of classic games for the original Wii, you're in luck. Nintendo has revealed that full-size downloadable Wii games are coming to the Wii U's eShop, starting today. Only Super Mario Galaxy 2will be available at first, but that'll soon be followed up by Punch-Out on the 22nd andMetroid Prime Trilogy on the 29th. It'll probably be a while (if ever) before you're playing an epic like Legend of Zelda: Skyward Sword without finding a hard copy, but you have to start somewhere. Back when we reviewed the new, dual-analog input-enabled Nintendo 3DS handheld, we weren't quite sure when it would make its way to the rest of the world -- that changes today. The slightly more powerful handheld launches on February 13th, 2015 in North America and Europe. To make it up to those who've waited patiently while the likes of Japan and, kind of, Europe got in on the extra shoulder button action, Nintendo's made a cabernet-hued console for us to wrap our fingers around. And what good is a new console without games to play on it? Nintendo has us covered there as well, with The Legend of Zelda: Majora's Mask 3D and Monster Hunter 4Ultimate. You know, in case you're already bored with the latest portable version ofSuper Smash Bros. There are even "New" 3DS XL Monster Hunter and Majora's Maskbundles headed to stores on February 13th with fancy designs. When Nintendo announced the New 3DS XL this morning, fans had one big question: where's the smaller one? In Japan, where the New 3DS launched last year, there were two versions of the system: LL and XL. The LL, a smaller model that's around the same size as the original 3DS and has customisable faceplates, went on sale alongside the XL in the east. Different territories make their own business decisions regarding individual products and timing. We think New Nintendo 3DS XL makes the most sense for our market. Nintendo makes different systems at different price points for a whole range of consumers, and New Nintendo 3DS XL simply expands those choices even further. So Nintendo, is it ever going to come out here? Monster Hunter 4 Ultimate will launch on February 13 worldwide, Capcom announced during this morning's Nintendo Direct livestream. 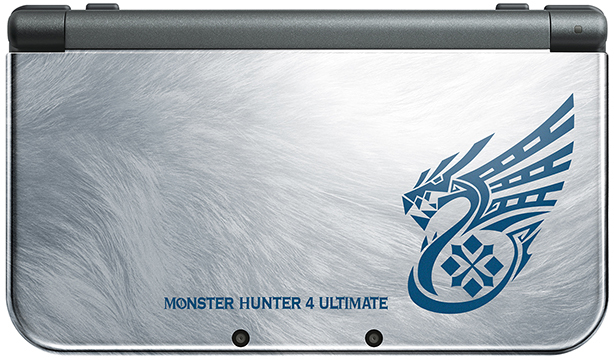 The game will be accompanied by its own themed (new) 3DS XL, featuring a brushed silver cover and blue logo. The latest Monster Hunter game launches on the same day as the standard, red and black versions of the new 3DS. Monster Hunter 4 Ultimate (Monster Hunter 4G in Japan) is the updated version of Monster Hunter 4, which first launched in September 2013 in Japan. 4G reached Japan in October 2014. Update: Nintendo offered a new trailer for the game, found after the break. Additionally, GameStop announced that the Monster Hunter 4 Ultimate 3DS XL will be exclusive to the retailer, and is available for pre-order today. The system will come with the game pre-loaded on it for $230, and customers will have to pay for the bundle in full upon pre-ordering it. With the launch of the New 3DS XL stateside, there will also be a Majora's Mask 3D limited edition released on February 13. 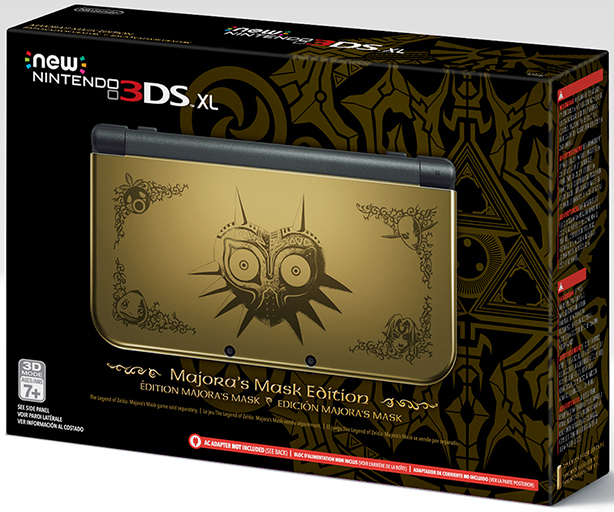 The bundle will feature a gold-tinted New 3DS XL featuring five of the game's masks, which transform Link into various characters from the Majora's Mask universe. The remastered Nintendo 64 game will launch on February 13 as well. Hopefully we'll have more than three days to snag it before an angry moon crashes into us. The folks at Analogue Interactive know that making a good looking game console only goes so far, and that it's what's on the inside that truly counts. 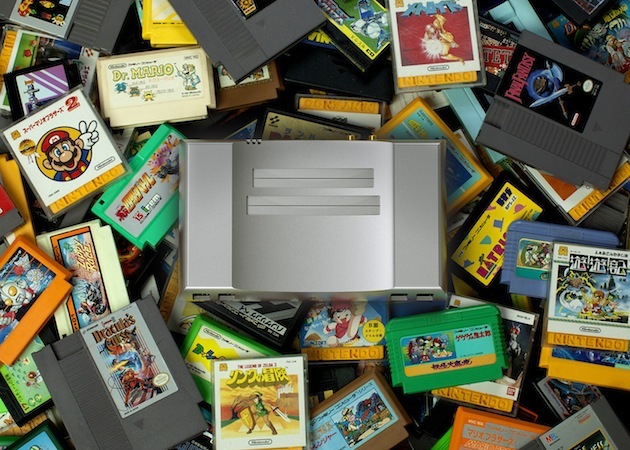 It's with that in mind that the solid aluminum Analogue Nt -- the outfit's take on the original Nintendo Entertainment System -- sports fancy innards in addition to its machined casing. AsPolygon writes, the system's motherboard is custom as well, sporting a fancy black printed circuit board, transparent solder mask and raised copper traces. We've embedded a picture after the break. Sounds pretty snazzy, right? Well, the outfit's still promising audiophile and videophile quality out of their little aluminum box that could, and units still command a $500 starting price for pre-order. You might balk, but remember, this is the same company that charged $1,300 (minimum) for a wood-encased Neo Geo. Comparatively, this is a steal. Rrrrrrrr... Vroooooooooooom! Whooooooooom! Fire! Boom! Fire! Boom! Whooooooooooom! Thwoooooooosh! Fire! Boom! Beep beep beep! Be careful! Wooooooooooooooosh! BOOM! 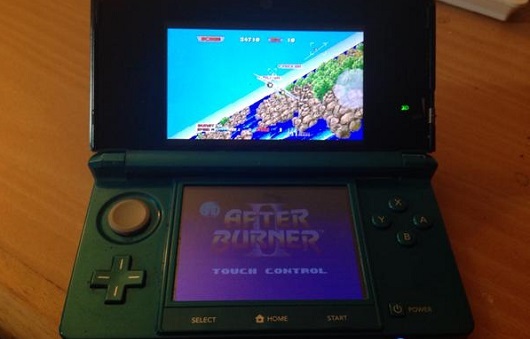 Fine... we'll put down our arm-wings and stop runningaround the room, but only to tell you 3D After Burner 2 is out on the eShop today. The latest in Sega's 3D-enhanced Classics range includes 23 stages, new difficulty settings, visual additions like smoke transparency, and multiple arcade cabinet styles. Also, there's a new "special mode" that's unlocked after you beat the game. In it, shooting down planes builds up a meter that, when full, lets you slow down time to avoid attacks and take down foes with ease. So it's a bit like the Climax Gauge in After Burner Climax, or Neo in The Matrix. Whichever you prefer. Alright, that's too much time not playing Human After Burner. Don't worry, we've included the full list of new eShop releases below the break and you'll find all thenew eSales here. Nintendo has launched a Build Your Own Bundle for the New Nintendo 3DS on its UK store.For £159.99, you’re able to choose your color of New Nintendo 3DS, either black or white, one of nine sets of cover plates, and then add a free Mario Holder (compatible with 3DS, DS, and DSi Lite).This bundle also comes with a charger that isn’t included with the regular £149.99 New Nintendo 3DS. Altogether, you’re saving between £25 – £30 with this bundle if you were to buy its contents individually. Pre-order the exclusive Nintendo NEW 3DS XL Monster Hunter 4 Ultimate Edition for $229.99 at GameStop! 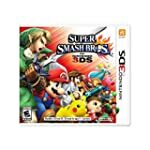 Grab Super Smash Bros. - Nintendo 3DS for $34.99 at Amazon! Battle it out as Nintendo’s greatest heroes and villains—at home or anywhere on the Nintendo 3DS system! Smash rivals off the stage with epic moves, then beef up your fighters with customizations and equipment. Find fun extras faster by beating hordes of classic enemies in Smash Run and mastering mini-games. Now you’ll never have to stop smashing! As fun as Super Mario World is to play, wouldn't it be nice if you could coach from the sidelines every now and then? The University of Tubingen has developed an artificial intelligence that lets you do just that. Its Mario AI project makes Nintendo's plumber both aware of his environment and responsive to your advice on how he should behave. 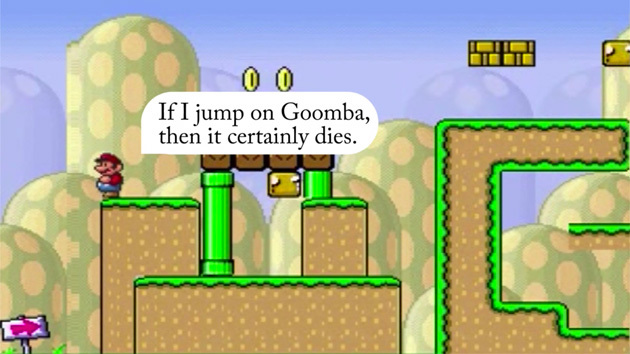 You can teach him that stomping on Goombas will definitely take them down, for instance. Mario even has his own systems for feelings and needs. He'll explore the world if he's sufficiently curious, and he'll chase after coins if he's "hungry." "Despite its glorious introduction in The Wizard, the Nintendo Power Glove was, from all accounts, a bit of a failure. However, Dillon Markey has given the doomed peripheral a new lease of life — it's a crucial part of making stop-motion animation for Robot Chicken. "The linked article doesn't have many more words, but the video it features is worthwhile to see how Markey has modified the glove to make the tedious work of stop-motion a little bit less tedious. Regionthree, by Smealum, is a way of playing imported or simply just foreign games on your Nintendo 3DS. You need to place the launcher.dat file on your SD card and otherwise just the game you want to play. Visit http://go.scmods.com/ in your Nintendo 3DS to start the foreign games. First ninjhax, now smealum strikes again with regionthree which is a region free loader for 3DS/3DSXL/2DS on firmware versions 4.0-9.4 based on the recent browser exploit. Check to see the loader in action. This also allows you to bypass mandatory gamecard firmware updates." - mapper 35 - prot fix? - CoolBoy 400-in-1 (Alt Version, 403 games)(Unl)[U][!]. HardWareMan once again delivered a new ROM, thanks a lot! He accidentally appears to have a new version of TeamEurope's cart released here 4th January. Previous version is older revision (internal signature of old version is "400 IN 1 zyx-8b2799", and new version is "400 IN 1 zyx-8b2922"), it has a lot of free space (about 700k). So this empty space was used in newer revision, three more new game hacks was added to the menu, so we now have 403-in-1 technically. There are many changes inside the newer ROM, but mostly this is shifted parts of various games, the rest of the games in list are identical to previous version. Three new games is a title and sprite hacks of japanese Ninja Gaiden 3, Adventure Island 1 and 2. Marat Fayzullin has released new version of its GameBoy Advance emulator VGBA-Android. Unfortunately, the Android version was removed temporarily with questionable complaints by Google from the Google Play Store. Google has removed my VGBA app from Google Play, claiming that "screenshots violate third party intellectual property" and "the application icon looks deceptive". As ludicrous as both these claims are, I am currently talking to Google, trying to resolve the issue. But it looks like I will have to republish VGBA under a new package name, meaning that everyone who needs an update will have to pay for it again. Because I do not want people to pay twice for the same thing, I am currently working to extend VGBA with new features that make it worth the extra money. I should have a new version published the next week. In the meanwhile, you can find the new free VGBA-Windows and VGBA-Linux 4.8 packages at the VGBA home page. Most changes are platform-specific, optimizing the way GBA screen is rendered. StapleButter offers version 1.3 of " blargSnes "excellent emulator for the Super Nintendo 3DS Nintendo. AlbertoSONIC offers version 2.0 of " 3DS Paint ". Utility that allows you to draw what you want on the Nintendo 3DS. The archive contains 4 binary (.3ds, .cia, .3dsx and .elf), each for its own launch means. - Now you can save your drawings to SDCARD (.bmp image output)! - Now using an UI framework! This is the first release of DownloadMii for the Nintendo 3DS. Download apps directly on the system, you will never have to unplug your SDCARD again! Updater, DownloadMii will automatically check for updates on boot! Dynamic applists, everything dynamic is server side! Big Red Menu is the first CIA manager (installer/uninstaller) for 3DS completely legal and opensource. It's wrote in both C++ and LUA (Heavy edited LPP edition) and ACTUALLY works only AS CIA. So to install Big Red Menu, you'll require BigBlueMenu or devMenu but, after its installation, you can delete these Nintendo copyrighted tools and starts to use Big Red Menu. Aurelio for helping during the writing of the lua_uninstallCIA code. Note: Big Red Menu lists only SDMC CIAs to prevent users to brick their 3DS with some NAND CIAs importing. Instead adding NAND and GAMECARD support is very easy. Note that Big Red Menu will list only dirs and CIAs file from SDMC so you'll not lose time finding your CIAs to import. Rinnegatamante , very active on the 3DS scene, offers version 0.5 of " ORGANIZ3D "manager and multimedia file player for the Nintendo 3DS. - Solved issues with huge BMPV files. Now every type of BMPV is currectly reproduced. - Fixxed a bug with touchscreen. Now it fully works. - Added Theme system to filebrowser with two themes as samples. - Solved alpha blending. Now is correctly calculated alpha channel for images. I edited first post with all new functions/features and infos. Please note that EXTDATA managing is still in a BETA phase so BACKUP YOUR Nintendo 3DS FOLDER BEFORE USING ORGANIZ3D RESTORE FEATURE. Technicmaster0 offers version 1.0 of " Useless Homebrew "Project DS port of the same name Rydian for the Nintendo 3DS. Jay van Hutten offers version 1.0 of " Flappy Bird ", a remake of the famous game of the same name of obstacles for the Game Boy Advance. 3DText is a very simple text viewer for 3DS. It supports all characters on an average keyboard, nothing too fancy. 3DText cannot write text documents, it can only read them. If you decide to edit the source on Github, you can change the file to read from to anything, or keep it at "test.txt". It can read files that aren't even in .txt format, as long as you change and build the source properly. I made this using ctrulib, so there's a lot of useless stuff in the source code. yellow8 offers version 1.1 of " 3ds homemenu extdatatool "Application for Nintendo 3DS, to install custom themes from the Home Menu. Use SaveDataFiler to dump Theme ExtData which ID depends on your console's region, either 000002CC, 2CD and 2CE. Go to Config app, other settings and change Menu to Test Menu. Restart your 3DS, go to SaveDataFiler and reimport edited ExtData. Return to Home Menu with Config app. If you want to make Custom Theme work nicely, change your base theme to anything besides default theme beforehands. If you don't, your theme will disappear after you put your 3DS to sleep mode. mastermodr94 offers the 1.0 version of " Simon "electronic adaptation of the famous board game of the same name for the Nintendo 3DS. Rinnegatamante offers version 0.8 of " 3DSurfer "Player audio (.WAV only) for the Nintendo 3DS. Here you are, this is a little and simple wav player coded with Lua Player Plus. It uses streaming functionality so, i coded it to show up how to use big wav files with LPP. In next releases, i'll add some features like file info showing (samplerate, time), playlist feature and other formats support. Maybe i can add also a loop function if someone is interested. Your wav files must be in /MUSIC folder. Sourcecode can be found in the homebrew itself (index.lua). Rikku2000 offers version 0.5 and 0.7 Beta " 3DSXLoader "Utility / assistant for the PC to easily load your homebrew to .3dsx format with emulators" 3DMoo "and" Citra ". 3DSXLoader is an Rom loader for 3DSX files, to use with Citra and 3DMoo Emulator. Few companies are as adept as Nintendo at selling you the same software over and over again, but Nintendo’s former indie boss has questioned how long this can continue for. On 3DS, for instance, NES games such as Donkey Kong, Mario Bros, Super Mario Bros, The Legend of Zelda, Ice Climber, Double Dragon and Galaga still cost £4.49 a piece, despite the fact that some date back as far as the early ‘80s. SNES games from the ‘90s cost much the same. However, while this strategy has until now held up reasonably well in the face of cheap smartphone software pricing Dan Adelman has questioned the long-term viability of this pricing strategy not because of the comparative expense but more because nostalgia doesn’t last forever. “Nintendo understands its importance to a lot of people’s childhoods, so they really want to avoid undoing that goodwill,” he told Dromble. “Everyone has a game that, for them, was their biggest memory as a child. “I haven’t seen any research on this, but I suspect the majority of sales on Virtual Console are from people who have already played the game as a child. I’m sure there are some cases of people going back and playing games they missed, but if I had to guess, I’d say that’s around 25 per cent of the market. The other 75 per cent are people reliving memories. Over the past few decades, we've come to learn two important things about Nintendo. One is that they make brilliant video games. The other is that they make absolutelybaffling decisions. Whether it's the lack of a unified account system or their persistent Virtual Console stubbornness, Nintendo's choices are frequently questioned by even its most loyal fans. People always wonder: why does the company behind so many smart games seem to make so many dumb decisions? Why does it seem like Nintendo is always in its own world, where they're steps behind their biggest hardware competitors in terms of online infrastructure and other features they should've got right by now? Dan Adelman, the former Nintendo indie champion who left last year to do consulting for independent game developers, has some insight into why Nintendo is so... Nintendo. And it's really interesting. In a newly-published (and fascinating)interview with Nintendo fan and reporter Emily Rogers, Adelman gives us at least one reason the company does what it does. Nintendo is not only a Japanese company, it is a Kyoto-based company. For people who aren't familiar, Kyoto-based are to Japanese companies as Japanese companies are to US companies. They're very traditional, and very focused on hierarchy and group decision making. Unfortunately, that creates a culture where everyone is an advisor and no one is a decision maker – but almost everyone has veto power. Even Mr. Iwata is often loathe to make a decision that will alienate one of the executives in Japan, so to get anything done, it requires laying a lot of groundwork: talking to the different groups, securing their buy-in, and using that buy-in to get others on board. At the subsidiary level, this is even more pronounced, since people have to go through this process first at NOA or NOE (or sometimes both) and then all over again with headquarters. All of this is not necessarily a bad thing, though it can be very inefficient and time consuming.The biggest risk is that at any step in that process, if someone flat out says no, the proposal is as good as dead. So in general, bolder ideas don't get through the process unless they originate at the top. There are two other problems that come to mind. First, at the risk of sounding ageist, because of the hierarchical nature of Japanese companies, it winds up being that the most senior executives at the company cut their teeth during NES and Super NES days and do not really understand modern gaming, so adopting things like online gaming, account systems, friends lists, as well as understanding the rise of PC gaming has been very slow. Ideas often get shut down prematurely just because some people with the power to veto an idea simply don't understand it. The last problem is that there is very little reason to try and push these ideas. Risk taking is generally not really rewarded. Long-term loyalty is ultimately what gets rewarded, so the easiest path is simply to stay the course. I'd love to see Nintendo make a more concerted effort to encourage people at all levels of the company to feel empowered to push through ambitious proposals, and then get rewarded for doing so. Too bad, right? On one hand, this conservative decision-making is undeniably one of the reasons Nintendo has survived for over 100 years now; on the other hand, come on. Go read the rest of Adelman's interview, too—it's full of interesting nuggets for anyone who's curious about Nintendo's motives and decision-making process. 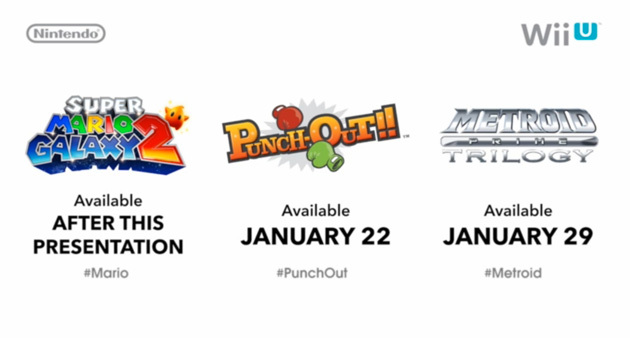 New Nintendo eShop releases: Half-price Punch-Out!! You can grab a Little Mac takeaway right now, because Punch-Out!! is on the Wii U eShop with a $10 price tag. Like last week's Wii re-releases, the 2009 boxer is available at 50 percent off in its first week, but be warned: After 9AM PT/12PM ET on January 29 it goes up to $20. That offer is part of Nintendo's Throwback Sale, which you can check out herealong with the last week of the current Super Indie Collection Sale. Otherwise, you'll find the complete list of this week's new eShop releases by ducking and weaving below the break. If the idea of Mario's ride ingesting Shy Guys and spitting them out as eggs in Yoshi's Island made you uneasy, this 3D first-person recreation of the game's first level will not help at all. Bestvegeta has taken the opening level of one of Nintendo's best platformers and made it weird. It's one thing to watch Yoshi merily devouring his foes from the sidelines, but when it's your tongue doing the deed it's something else entirely. Had I made this video I would have embraced the horror a bit more. Maybe made the Shy Guys scream as they were dragged towards Yoshi's gaping maw. Tweak the audio mix so you can hear their muffled cries as if they were coming from inside of your body. Ever been freaked out by your own imagination? Nintendo posted a huge increase in profits and raised its earnings forecast, but cheap yen is masking weak sales. Nintendo profits for the nine months ending December 2014 hit 59.52 billion yen (£332.6m), which is up almost six fold on the year before. This is primarily down to the launch of hit 3DS products such as Super Smash Bros and Pokemon, whereas Smash Bros and Mario Kart 8 were big sellers on Wii U. However, 3DS sales faltered somewhat as the console begins to reach saturation point (it will be four years old in March). The firm also revised its forecast, and it’s mixed news for the business. The firm expects net sales to fall by 40m yen, while operating income will half. That would be a reason to worry, however, a favourable exchange rate means that the firm will actually post a bigger profit than expected. 70 per cent of Nintendo’s business takes place outside of Japan, so a weak Yen can make a serious difference to its bottom line, as proven this year. So how did Nintendo’s products perform? Well top of the pile is Pokémon Omega Ruby and Alpha Sapphire, which sold a huge 9.35m units, followed by Super Smash Bros which shifted 6.19m units. In total, 53m 3DS games were sold last year. The No.1 game on Wii U was Mario Kart 8 with 4.77m sales, followed by Smash Bros once again with 3.39m units sold. 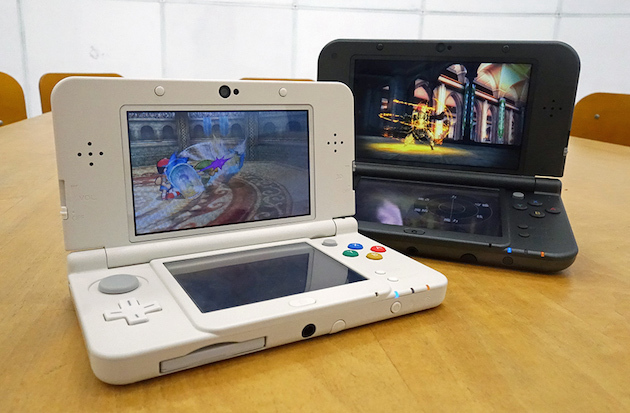 3DS continues to sell huge numbers in Japan, boosted this financial year by the arrival of New 3DS and New 3DS XL. However, 3DS saw a significant decrease in sales across Europe and US and as a result the number of 3DS’ sold during the nine month period was 7.08m, a drop on 11.65m posted a year previous. The New 3DS launches in Europe and America next month. The New 3DS is off to a "good start" according to Nintendo, after the enhanced handheld shipped 1.84 million units by the end of 2014. The company launched the New 3DS and its XL variant in Japan back in October, before bringing them to Australia the following month. The New 3DS' arrival helped take the "3DS family" beyond the 50 million mark, and as of December 31, 2014, the 3DS total is 50.41 million units shipped worldwide. On the other hand, Nintendo says 3DS sales haven't grown sufficiently in North America and Europe this fiscal year; both regions are waiting for the New 3DS to launch there next month. 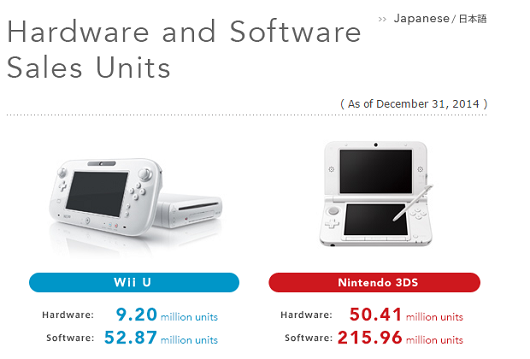 Between April and December 2014, Nintendo shifted 7.08 million 3DS systems worldwide. While the Wii U has gathered steam in recent months, it's still tracking a long way behind its handheld sibling. Nintendo shifted 1.91 million consoles worldwide during the busy holiday quarter of October to December 2014, taking its nine-month figures to 3.39 million, As of the end of 2014, its two-year lifetime total is 9.2 mllion systems and 52.87 million software units. For some folks, eating alone is awful. 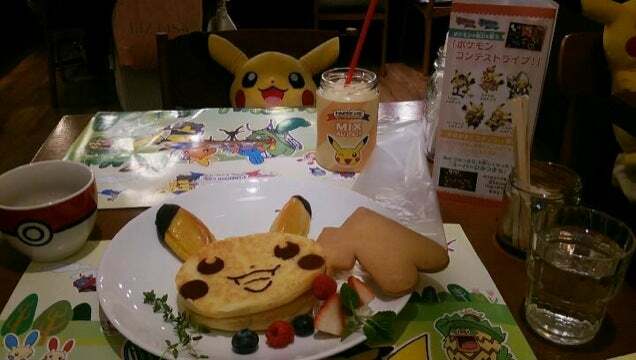 But not at the Tokyo Pokémon Cafe, where Pikachu will watch you eat. As noted on Naver, people visiting the cafe solo get to sit across from a plush toy Pikachu.